Motivation, especially in cooking, can sometimes be elusive and sometimes have the gravitational pull of Jupiter. Early May in New England still awaits the full throttle of Spring, but I’m all too often motivated when it comes to Spring-time cooking, with fresh ingredients from early crops such as asparagus. 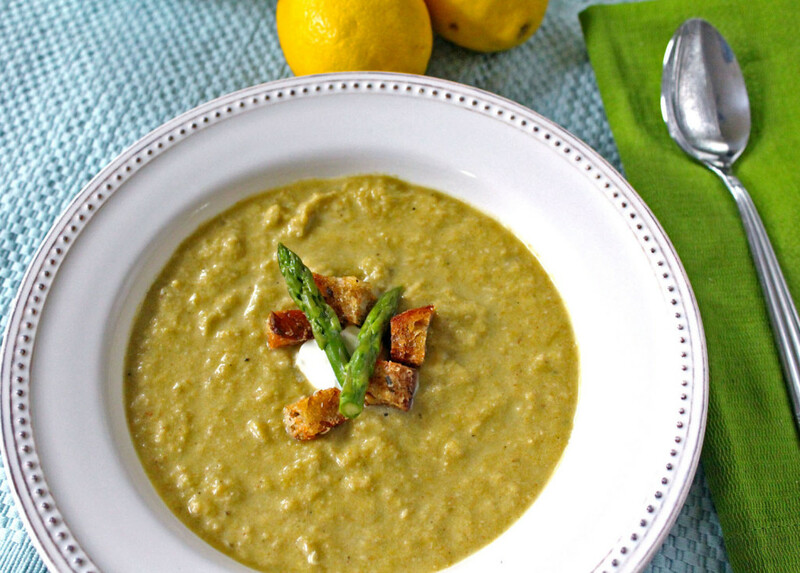 Asparagus has a wide range of possibilities, however a fresh homemade soup was the end game on this day. This is a simple recipe with earthy undertones and with hints of fennel hiding delicately in the background. It was the juice from a whole lemon that added the secret ingredient and delivering that blast of highly anticipated Spring. Garnished with subtle lavender scented croutons from fresh baked sourdough also added texture and depth. For me, being motivated and inspired in cooking seems easy as it represents my definitive and true passion. With a warm fire crackling and empty bowl and spoon in hand, I find myself aspiring for a second helping while awaiting the warmth of Spring. TIP: Emulsion blender is preferred, but if using food processor, process in batches. Cut top tips from asparagus and set aside. Cut bottom 2 inches from each spear and reserve. Cut remaining stalks into 1 inch pieces. In a medium pot, bring stock to a boil. Add the bottom of stems, reduce heat and simmer for 20 minutes. 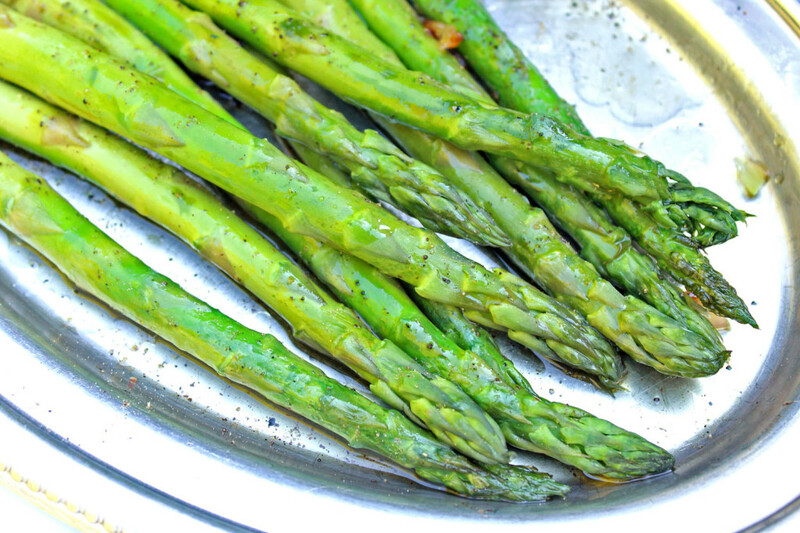 Remove asparagus bottoms with a slotted spoon and discard. Add asparagus tips to stock and blanch for 2 minutes. Remove asparagus and reserve for the garnish. Reserve stock. In large pot over medium-high heat, warm oil, and then add leeks, shallots, fennel, and garlic and cook for 5 minutes. Add chopped asparagus stalks, salt, and pepper, and cook for 3 minutes. Add reserved stock and parsley sprigs, reduce heat to low and simmer for 20 minutes, then remove from heat. Using a hand-immersion blender (or in food processor), puree soup until smooth. Season to taste. Whisk in yogurt, lemon, and parmesan, and warm soup on low for 3-5 minutes, stirring occasionally. 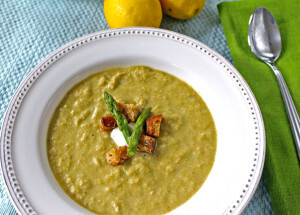 Serve and garnish with sour cream, lavender croutons and asparagus tops. Cut fresh bread into cubes and place on backing sheet. Drizzle lightly with olive oil, and season with salt, pepper, and fresh lavender leaves. Top with small amount of grated parmesan cheese and bake in oven for 5 minutes until crisp, flipping toasts mid-way. This entry was posted in Cooking, Main Dishes, Seasons, Soups, Spring and tagged Harvest, Vegetables, Vegetarian by cfaust. Bookmark the permalink.